After we moved into our new place I noticed that our book shelf needed something on it to fill the gap between it and the ceiling so I started collecting vases and bottles to use for décor. 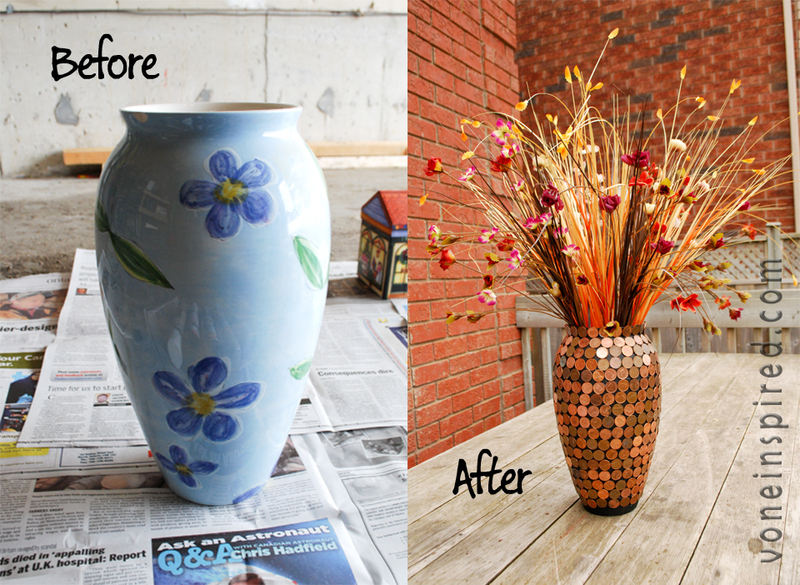 This big beautiful blue floral vase was left in the house by the previous people – the colour didn’t fit with our current decor so I spiced it up by covering it with pennies. And since Canada has phased out the penny I thought this was the perfect ode to the penny. First I spray painted the vase with black and let dry. Then I found all the pennies we had in the house and started glueing them on. I used a glue gun and started at the top of the vase. I didn’t worry about the direction of the penny or what side I used (or if they were Canadian or US) just keep glueing, row after row. I ran out of pennies at the bottom, I hunted everywhere for more but when stores aren’t giving out pennies any more it was harder to find more. And now when it’s up on the bookshelf you can’t see the bottom anyway. The flowers inside are from the dollar store and like the pop of colour they bring. The other bottles I’ve been meaning to do something to as well but for now the vase is the star of the show. This entry was posted in Life and tagged craft, decor, DIY, tips, vase by Miss P. Bookmark the permalink.